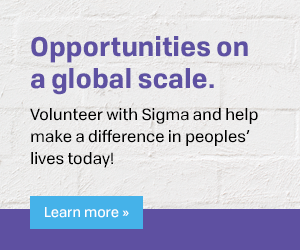 Sigma is your connection to nursing worldwide. Discover how Sigma collaborates with other organizations to improve the health of the world’s people. Global Regional Councils serve as a regional champion for Sigma, establishing an international presence in each region to expand global initiatives and services, and to support chapters and members in achieving Sigma’s mission. The purpose of GAPFON is to establish a voice and vision for the future of nursing and midwifery that will advance global health while simultaneously strengthening professional roles. A challenge designed to recognize the creativity and contributions made by chapters that have developed and launched programs, projects, or activities that address the GAPFON strategies. Learn about the UN Sustainable Development Goals and how you can make a difference. Institute for healthcare professionals pursuing a position or role in the global health field.